Borderlands 2 in third-person? We're game! Digital Extreme Development Team members casually discuss two more of Warframe’s upcoming, epic characters, Loki and Mag, while drinking delicious coffee. After we watched this video, we immediately saw the similarities between Loki and Mag with their Borderlands 2 counterparts, Zero and Maya, and got extremely excited for its release day. Loki has two very common powers for an assassin type of character: “Invisibility” and “Decoy”. Very much like Zero from Borderlands 2, he can disappear from enemy sight and reappear where ever he so chooses, or leave behind a holographic decoy to distract them while he gets into position to kill. “Switch Teleport”, however, has some very interesting concepts that normal “ninja” type classes would kill to have these day. Create a decoy or target an enemy and switch places with them, taking another step in outsmarting an intelligent enemy or just to reach areas you couldn’t before. We get a more "sorcerer" or "magician" type of vibe when we see Mag in action, as her two main powers revolve around “Pull” and “Magnetize”. “Pull”, like the name states, pulls enemies towards you and can allow for some interesting usage of the battlefield with some strategy. “Magnetize” is a way to support both yourself and team members by targeting an enemy and enveloping them in a bubble that directs all projectiles towards it. Mage also has a “Phaselock” sort of ability, quite like Maya’s in Borderlands 2, called “Crush”, where she pulls enemies up into the air and contains them before crushing their bodies into debris. In all, she’s one tricky character that loves to manipulate her enemies. Warframe is currently in alpha testing, with beta testing arriving very soon. 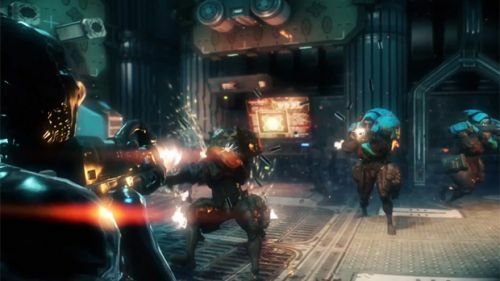 You’ll be able to get the chance to play 4-player co-op on Warframe this coming winter on your PC. Stay in touch for more developer diaries to come!